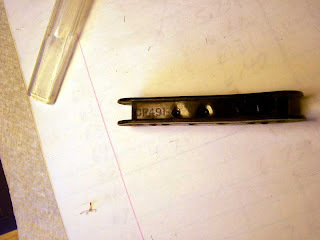 I got an old "Gibson Patent Number" humbucker in this week to rebuild. Early Gibson humbucking pickups had a sticker on the bottom that read “Patent Appiled For”. Gibson got the patent for its humbucking pickup in July 1959 but the PAF sticker stuck around until late 1961 or early 1962. At this time a new sticker started showing up on the base plates of the Gibson humbucker. It was “Patent No 2,737,842”. 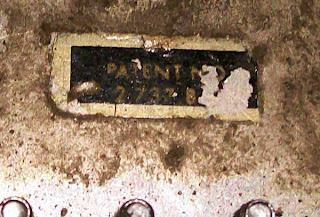 Humbuckers with this sticker from 1962 till 1965 are called “Patent Number” pickups and are starting to become very sought after. The earliest Patent No. units are identical to the more famous PAF pickups in every way. In late 1962 Gibson started using black jumper wires at the end of the coils and white jumper wires at the start instead of the all black ones of the PAF. In Late 1963 they started using Polyurethane coated magnet wire to wind the bobbins instead of the dark colored plain enamel of the PAF. The bobbins are made form butyrate and prone to warping. 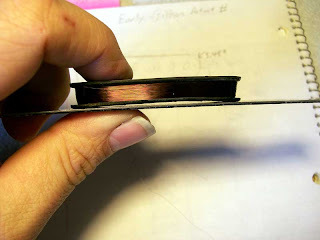 The magnets are sand-cast Alnico 5 magnets and the maple spacers are just like the earlier PAFs. This one is all done and heading back out to CA. today. We didn't wax pot it because they were not potted to begin with and this is a restoration. Bobbin, Bobbin whose got the bobbin?